Our mum, Dhira Chaliha, got her flying wings in 1961, at the age of 21, in India and to us as children, it held no amazement because we had grown up with the fact. But clearly for a woman at that time in that place, it wasn’t ordinary. Not just because flying required formidable courage in small planes without parachutes or radio contact, but the courage to break the mould and trail-blaze – in the 1960s, when women had barely made it out of the home in to an office and many people held the belief that the skies were no workplace for a woman. Mum was born in 1940 in Assam, British India, and as a child, would climb trees to get a closer look at the warplanes that made bombing runs to and from the Burma battlefront. I can’t help thinking, it was perhaps high up in those branches of a backyard tree, while her three sisters played on the ground, that the seeds of her dream were first planted. to become pilots within two years. Her father agreed at once, her mother wasn’t happy. I never fault my grandma for having those thoughts. They were the thoughts of their time, not before. She was born in the late 1800s when women in India got married to men arranged by parents, to look after the home and when women around the world didn’t even have a say or a vote. My grandma must have thought, how did airplanes fit in to their life? Flying was bizarre. Untraditional. What would people think? This could affect her marriage chances. She just wanted the best for her loved daughter in the way she had always known. My grandfather, Kamaleshwar Chaliha, was a man years ahead of his time, a Gandhi-ite of simple living and high thinking, a professional writer and poet, an egalitarian who invited so-called ‘untouchables’ in the neighbourhood for meals in his house. His was the final say and it was strangely poetic and a tad paradoxical that patriarchy had liberated my mum to fly. Two weeks after the interview, the postman handed her a letter. Out of thousands of applicants, she had won a flying scholarship and she was elated. On the enrolment day, at 4 am, an Assam Flying Club jeep arrived to pick her up with the other trainees and so started a routine that would happen twice a week for the next two years. The flying lessons took place at sunrise before her college classes, on small two-seater propeller airplanes, the legendary Tiger Moth and the native Pushpak. 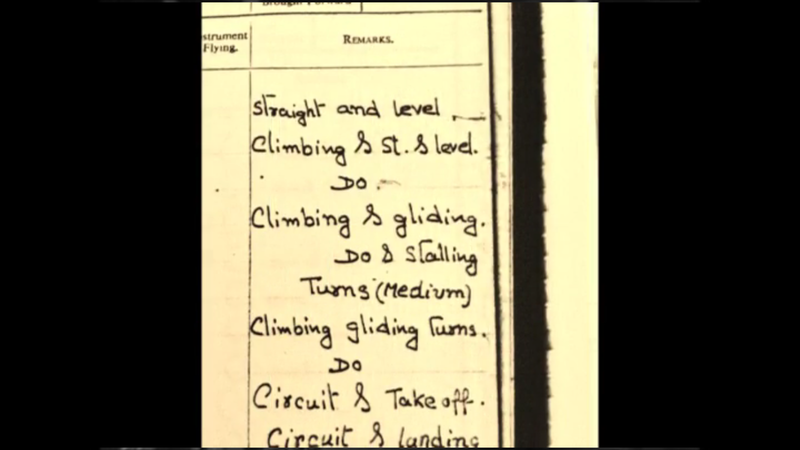 Her log book lists all the training manoeuvres; ‘loop the loops’; ascents; forced landings in paddy fields that made the plane bump along in clouds of dust; diving towards the ground before pulling level; ‘figures-of-eight’ and low flying. Although the lessons were exhilarating, college classes and going home must have paled in to the mundane in comparison. Her mother was still not happy about her daughter taking flying lessons and would lock the front door every evening and hide the key, but my mum would listen carefully from her bed for the tell-tale sound, the slight tap of a key on wood, so she would know exactly on which shelf or door-frame it was hidden. One morning the flying instructor told her she was ready for her first solo flight. 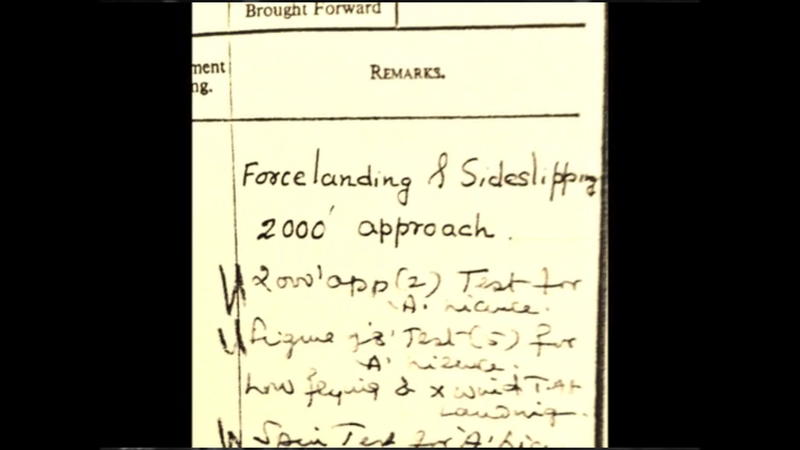 “Just watch your descent angle when you land,” he advised before wishing her luck and hopping out of the cockpit. She was taken aback for a few moments but then ran through the training in her head. A hangar-hand pushed downwards sharply on the front propellors which whizzed in to life; the engine spluttered then roared at the touch of the throttle; the plane hummed; the chocks were pulled away; the plane taxied forward. She picked up speed and pulled on the joystick, the grass verges on the runway started to blur. Gradually, the plane became airborne and climbed as she sank deeper into her seat. And that was it. Her very first solo flight. Now there was only her, the aircraft the early orange sun in a sapphire blue sky and the intense lightness of being free. Exaltation. Elation. Joy. 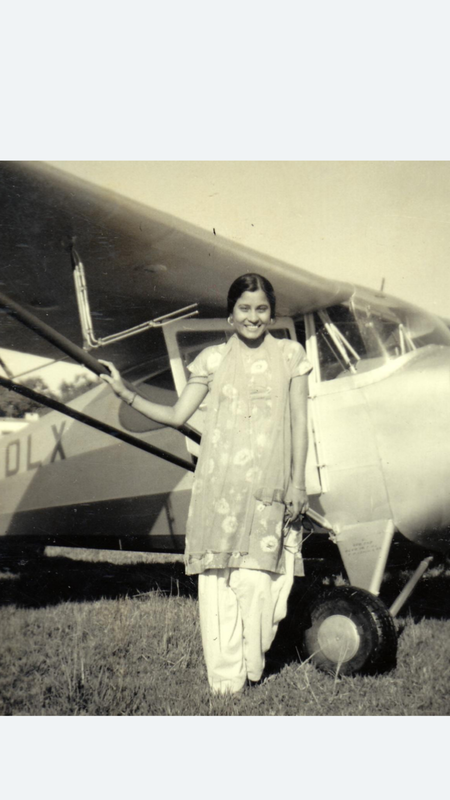 Assam has many small airstrips most of them created during the Second World War and her solo flights took her zig-zagging across the skies, from Gauhati to Tezpur, Jorhat or Shillong, and back just in time for college classes. Air traffic control was rudimentary to say the least: without radios to communicate, gaining permission to land was simply a case of circling the airstrip until the light at the control tower turned green. During one notable solo flight, her airplane was caught in a violent monsoon thunderstorm, buffeted in dark clouds, with deafening thunder claps that made her ear drums sing and hurt. She describes the incident as if it there was some power outside the plane who was determined to counter her every manoeuvre to see her perish – every time she pushed to level the plane, heavy turbulence would try to push the plane the opposite way, taking it out of control. She eventually managed to ascend the monsoon storm in to tranquil blue sky. It’s evident from her stories that mum had a rebellious-teen streak too – in the early 1960s, a huge bridge was being constructed over the Brahmaputra River at Saraighat in Gauhati and construction had started with huge pillars rising from the river bed. She dared to fly between the pillars nearly getting the undercarriage wet – this clearly wasn’t part of the training. In March 1961, hundreds of people gathered in the village of Azara by the airport to spot a small buzzing dot in the sky, to catch a glimpse of the Assamese girl who flew. After 60 hours of solo flight, Dhira Chaliha, became north east India’s first female pilot. She was aged just 21. If she had been a man, she could have perhaps pursued her career further and gone on to earn her commercial pilot’s licence, to fly airliners, but things are more complex for a woman, especially in India. Two years later she got married to my dad and came to London, where she continued to fly in Biggin Hill in Kent – each time, my dad would have to explain that he wasn’t the pilot, but the diminutive woman in a sari by his side. Soon, she had to choose between family and career. Her dream beckoned further, but she chose her family. Nevertheless, those years, when she soared above eagles, between jealous clouds, gave her an unshakeable self-belief. Today she helps inspire young women in north-east India, a role model for women to achieve their dreams no matter the odds. Today, nearly half a century later, when boarding a flight she still feels an urge to turn towards the cockpit not the cabin. She still harbours a desire to go up in a small plane once more and take its controls. Her eyes light up at the very thought. It won’t surprise me if she does one day, for she’s my mum… the pilot. THANKS FOR THIS STORY. I want to become a pilot, but it’s sooo expensive in my country. My parent aren’t agree so i’m waiting to save some money to start the classes. My best wishes from Argentina, this story has been a real inspiration for me. xoxo i can’t explain what i feel when i see airplanes flying.. it’s a passion. I’m so happy you’ve taken some inspiration from mum’s experience. Wishing you the best of luck. What really made it for her, was winning the flying scholarship as flying can be an expensive business. I’ll send mum these comments, she’ll love to read them. Good luck once again. I am new to WordPress just started and i am so glad its the first thing i read. your mum’s story is really inspiring specially to me as I am from Assam and its almost sounds unbelievable that a women from here learned to fly at that time…its still not a very easy task to achieve for women from Assam …….thank you for your inspiring post and thank you to your mom for doing it…. Hey thanks for your feedback. Yes the older I get the more amazed I get about mum’s accomplishment. As a child a just accepted it unthinkinglly (“mum flew,” I’d tell my friends). There are more and more women pilots so things are improving. Thanks Liu! Glad you enjoyed the read. Mothers are awesome! Toughest job in the world. Thanks a lot Sidharth for your great feedback. I’ll certainly let mum know. I don’t know what combination of keywords lead me to your post, but girl, am I glad it did! I could feel your mum’s excitement and passion, and maybe even caught a glint of the sun in her eye. Gorgeous woman. Please convey our absolute adoration to her, and that choosing family over career didn’t diminish her achievement in anyway. Fantastic writing, as well. Glad I stumbled upon your blog. Hey Payal, thanks so much for your comment and the follow – glad you enjoyed the read. I’m going to be printing off these comments and sending them to her in a letter. She’ll be thrilled. Loved reading it. Loved feeling inspired. Thank you. I will relay your comment to mum. hey m also from Assam..salute to ur mother.thnks for sharing such an insoirational story of ur mum. Thanks for your inspiration. I was pass this on to my mum. If it helps inspire young women who hope to fly then I’m very happy about that! Thanks for sharing! Your mother sounds like an amazing woman. Thanks Andy for your appreciation. I’ll be printing off these comments and showing her these comments. She’ll be really happy that it’s bringing inspiration so long after the event. Go women fliers! As a female pilot as well, your mom sounds like a fascinating woman. You were very lucky to grow up with someone so inspirational. Thanks Skyalive. You’re right it was a privilege and an education and the older I get, the more it inspires me. Glad you enjoyed the post. nice to know about her. Thank you for the write up. Exceptional and inspirational. What a great story. We r proud of Shira chaliha. We read about her on newspaper, magazines. Many articles were published on her. Proud of her as an assamese. what an inspiration and bold women she was. Thinking of being a pilot in those days is itself the most challenging one. I would like to share your post. Thanks Siwani. Yes it certainly was a bold thing to even contemplate. I’ll pass on your comment to my mum and feel free to share it. Thank you so much!! I would like to interact with you and your maa, as i really want to know the experiences she encountered those days . . May I know any way of contacting you, ( either in mail or whatever convinient ). Stumbled upon this post when I was trying to search for your mom’s name. My dad Capt M.Balan, he is 94 now, was the pilot instructor in Assam Flying Club who taught your mom and your mom’s photo with the plane is in his photo album! It was so nice to see the photo again in your post! I was a small boy that time. Wow Karthik! The power of the internet . I just contacted mum, and she remembers your father of course, he presented her with her licence all those years ago. She also fondly remembers you and your sister Bhubna. We have some photos of you both crouching beside a Pushpak. I wondered who those children were and now I know. Mum spends her time between Assam and London now depending on the seasons. Quite appropriate for a pilot to have migratory bird behaviour! Where’s your father living now? Hi Karthik, do you have a contact detail you could send me? Thanks for the reblog David. Really proud to learn this. “Walking Tall – Never Say No & Never to Look Back” Bravo Lun! Your mother was truly a spectacular woman – a winner in every sense. Thanks Nova for your comments. I’ll certainly pass them on to mum.